^ Orloff, Richard W. (September 2004) [First published 2000]. “Table of Contents”. Apollo by the Numbers: A Statistical Reference. NASA History Series. Washington, D.C.: NASA. ISBN 0-16-050631-X. LCCN 00-61677. NASA SP-2000-4029. http://history.nasa.gov/SP-4029/Apollo_00g_Table_of_Contents.htm 2013年6月12日閲覧。. ^ Kranz, Eugene F.; Covington, James Otis (1971) ["A series of eight articles reprinted by permission from the March 1970 issue of Astronautics & Aeronautics, a publication of the American Institute of Aeronautics and Astronautics."]. 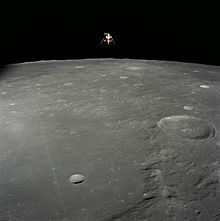 “Flight Control in the Apollo Program”. What Made Apollo a Success?. Washington, D.C.: NASA. OCLC 69849598. NASA SP-287. http://history.nasa.gov/SP-287/ch5.htm 2011年11月7日閲覧。. Chapter 5. ^ Jorgensen, K.; Rivkin, A.; Binzel, R.; Whitely, R.; Hergenrother, C.; Chodas, P.; Chesley, S.; Vilas, F. (May 2003). “Observations of J002E3: Possible Discovery of an Apollo Rocket Body”. Bulletin of the American Astronomical Society 35: 981. http://adsabs.harvard.edu/abs/2003DPS....35.3602J. ^ Immer, Christopher A.; Metzger, Philip; Hintze, Paul E. et al. (February 2011). 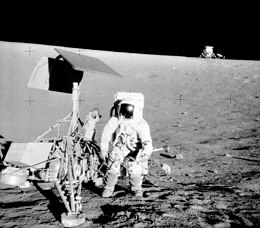 “Apollo 12 Lunar Module Exhaust Plume Impingement on Lunar Surveyor III”. Icarus (Amsterdam: Elsevier) 211 (2): 1089–1102. Bibcode: 2011Icar..211.1089I. doi:10.1016/j.icarus.2010.11.013. http://www.sciencedirect.com/science/article/pii/S001910351000432X 2013年6月23日閲覧。. ^ “One Small Step”. Apollo 11 Lunar Surface Journal. NASA (1995年). 2011年11月7日閲覧。 Note at 109:57:55.